The Overview window displays a small map with a larger extent than the current map. 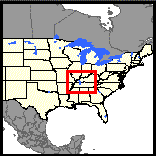 The current map's extent is shown in this window with a red rectangle. Display the Overview window by clicking the overview icon in the Toolbar (if the icon is not present, no overview map is available). As you zoom the map in or out, the Overview map's extent may change so it shows an area somewhat larger than the main map. The Overview map may look different from the main map. Layers may be visible at different map scales (zoom levels). Also, if the website uses multiple map services, only one will display in the Overview map. The Magnifier window allows a close-up view of a small portion of the main map. To display the Magnifier window, click the Magnifier icon on the Toolbar. The Magnifier window can be moved, collapsed and closed as desired. See Getting Started for details. To magnify an area of the map, move the Magnifier window over the area by dragging on its title bar. A small red rectangle shows the area that will be magnified. Once you drop the Magnifier on a location, a zoomed-in view of the area will display within the Magnifier window. The amount of magnification can be changed with the drop-down list in the lower left of the Magnifier window. If the website uses multiple map services, only one of them will display in the Magnifier window. The administrator can set the map service to be used.